7.24 points at 33 votes (rank 281). 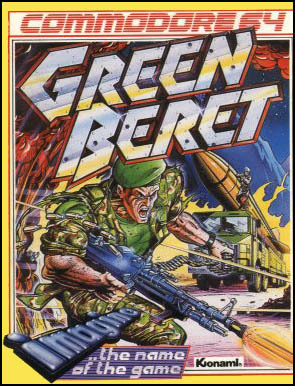 Green Beret is based on the arcade machine by Irem (1980) and by Konami (1985). In the North America the game was also known under the name Rush'n Attack. The player needs to steer a figure of an American soldier through four levels (Missile, Harbour, Bridge and the Prison Camp) and free prisoners of war. The walking direction is as typical for the genre from left to right and there are two higher platforms that can be reached over ladders. As moves you can lay down on the ground, jump and climb up and down the ladders. On the way to the destination you meet numerous enemies which you are not allowed to touch because you would lose a life. As enemies are constantly coming in from the left and right, you should try to finish the level as soon as possible as the difficulty grade is enormously high. Also, you cannot stay at a place for too long as then a jet appears and bombs you. However, in the level there are further starting points to which you are set back if you lose a life. By this you do not always have to start again from the beginning. Hitting enemies gets you points and after each 25.000 points you get a life. The graphics are simple but well recognizable. The levels are diversified conerning the design of the background graphics and between the levels there is a short animation in which the hero climbs over a fence and thus gets into the next level. The sound is kept very simple but fits rather well. There is a longer intro music, an end music and in the game you are accompanied by drum roll in all levels. A level starts with a siren sound and the end boss is announced in the same way. You can either fight the enemies with a weapon that you have collected (these have mostly only 3 - 4 shots), or you use the knife with which you are equipped. Knife: Standard weapon, removes one or several enemies that you hit with it. Flame thrower: 3 shots, removes all enemies that are currently on the screen and coming from the direction into which you fire. You can see the flame thrower in the animation. Bazooka: works like the flame thrower but has 4 shots. Hand grenade: 3 shots, hard to use as it flies away in a bow instead of a straight line as the other weapons. White: These enemies are firmly positioned and drop a weapon that you can collect. They also climb on ladders. You can see them in the upper animation. Blue: most numerous enemies, also climb on ladders and have a gun with which they shoot every now and then. You can avoid the bullets by lying down or jumping at the right moment, which only seldom succeeds due to the high speed of the other enemies. They can be seen in the animations. Brown: In the standard version these are the easiest enemies, they only run and do not climb on ladders. In later levels you also meet them creeping on the ground or armed with a Bazooka (then they also climb ladders and shoot at you). They can be seen in the animations. Green: These enemies walk towards you and jump at you. They appear less often but are often used as end boss or they come down as skydivers and throw bombs.They can be seen as jumping enemies in the animation above. Green-black: These enemies are firmly positioned, same as the white ones. They do not move, but have a mortar with which they open the fire on you. They can be seen in the animations. Dogs: Only appear as end bosses of the Harbor level and are very fast. Grey-blue: Throw grenades and only appear as end bosses of the Prison Camp. At the end of each level there is an end boss which needs to be destroyed before you can go on. It is announced by a siren signal after arriving at the end of the level. You run through a military base in which tanks and trucks loaded with missiles are standing. At the end there is a launching platform for 3 missiles, here you meet the end boss. In the level you find white enemies which drop a flame thrower at three locations. As end boss you get a truck driving towards you out of which several waves of brown and green enemies emerge. You cannot move your figure fully to the right border of the screen, you should stand approx. on the level of the missile in the middle and wait for the waves. Tip: Position yourself in the middle, walk a bit towards the wave, lie down and only take care of the brown enemies if they are led by a green enemy with a bit of space. The green jumps over you then. Before the end boss there is one more flame thrower which you should keep for the other waves (e.g. two greens or one green at the same place with a brown). In this level you walk through a harbour in which containers and tanks are placed and submarines are anchored. Here also green enemies come down with parachutes in beetween. In this level the white enemy drops the Bazooka. As end boss the green enemies with dogs approach from left and right. Tip: stay lying in the middle and use the knife. This level reminds of an airport, because you can see parts of airplanes behind walls. In this level you find hand grenades at the white enemy. As end boss you face several helicopters which you best defeat with the Bazooka. This level consists of a few storehouses, that you pass, and a wall. At the end of the level several waves of enemies come as end boss from the left and right. These are (from the left and right) the blue enemies which, however, do not seem to shoot, the jumping green enemies (always from the right), brown enemies with Bazookas (always from the left) and uniquely in this game another enemy type that can throw grenades. To defeat the enemies at the end you have to walk between the left and right side two and fro. The only peril comes from the brown enemies, but if you do it skillfully, you can make it. After this end boss the prisoners are free, as accompanying music you hear shortly the national anthem of the USA and with "Proceed to next camp" the game starts anew. Mostly it is the best way to walk on middle height, as there are no mines on the ground and most of the time the white enemies are here. If several enemies approach, it is best to jump over them with the help of a higher platform; do not try to kill them all, because the unpredictability of the blue enemies makes them very dangerous. 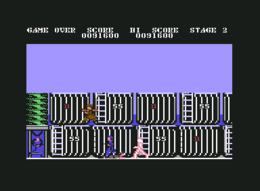 However, in the last level at the storehouses it is sensible to always walk at the top, throw many grenades and jump on the next house (you land in the middle) and climb up again. There are enough white enemies with grenades and this seems to be the only place in the game where you can use them profitably. Do not keep standing in ladders, if you have to lie down the character with instead climb down the ladder, which will take longer and keep you in the enemy's fireline. Do not stand below the edges to higher platforms if brown enemies walk on the top, they let themselves fall on you from the edge (other enemies always jump off the edges), otherwise they turn around at the edges and walk into the other direction. Do not stand on ladders if blue or white enemies are above or below you, they will climb and then get you. By the way, it is possible to climb in pairs on a ladder, if one is left and another right, they do not meet. If green enemies are followed closely by others, then walk towards them and lie down shortly before them (i.e. you let them jump over you), otherwise you will hit the green but get caught by the following enemies. If a blue enemy is behind you and two come from the front, then most of the time the second to the front will shoot. It is also helpful to jump over the enemies that walk to the right and then walk behind them, because as long as they are not out of the screen, there will be no new enemies! You cannot walk completely to the right in any fight against the end boss, therefore you should keep away from that as much as possible to not jump against an invisible wall and by this land on an enemy that comes from that direction. With the CCS64 emulator you can set the "Fire Button 2" to the "Space" key in the menu "Options/Input/Define Joystick Special" and this way stab with the knife via fire button 1 and trigger the additional weapon with fire button 2, which facilitates the whole thing enormously. If you jump into the air and then press the 1 on the keyboard, you stay there until you let go of the 1. But after a certain time a jet appears and you get bombed ;). With certain basic commands that you find on the internet you can allegedly give yourself more lives or make you invulnerable. Mark: The game is simply built, but due to the difficulty grade and the high speed it fascinates rather much. Unfortunately, you lose your lives rather fast through small unfair things, e.g. you can hardly guess when the blue enemies will shoot and then you can hardly avoid the missiles. Most of the time this happens 2 cm in front of the pawn, so that you just have no chance. Another nuisance is that you can hit the enemy while standing, but as soon as you lie down the knife is behind the enemy so you cannot hit him and are touched by him. These things quickly drive you up the wall, but you should have seen the game at least once. Robotron2084: Technically this game is top - as so many by Imagine - and this one I think is even better than the arcade version. But the difficulty grade is as already mentioned really monstrous, as you are continously supplied with a true avalanche of enemies. However tiny the mistake, it leads to losing a life so that you have to act with machine-like precision, which really stops the fun. Permanent stress and uttermost concentration are required here. In other respects, I can recommend the game without reproach. 8.5 out of 10 points. This page was last modified on 19 January 2018, at 20:28.